Eighteen years ago two princes of the island kingdom of St. John del Mar were kidnapped and murdered, a deadly plot by the rival kingdom of Mondrago. Everyone knows the story, but for Elias, Mercedes, and Ulises, the aftermath of that tragic day is deeply personal. Elias grew up without his father, who was killed trying to protect the princes. Mercedes is half-Mondragan, leaving her to grow up in the shadow of del Mar’s hate. And Ulises, as the youngest and only remaining prince, inherited the throne meant for his older brothers. Now, the three friends just want to move on with their lives. But when two maps surface—each with the same hidden riddle—troubling questions arise. What really happened to the young princes? And why do the maps look like they were drawn by Elias’s father, whose body was never found? To discover what really happened that fateful day, Elias, Mercedes, and Ulises must follow the clues hidden in the maps, uncovering long-held secrets and unimaginable betrayals along the way. But the truth is dangerous, and not everyone wants it to come out. 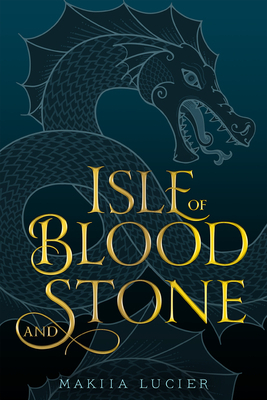 Isle of Blood and Stone is a sweeping fantasy full of intrigue and schemes, romance and friendship, and fearless explorers searching for the truth. Makiia Lucier grew up on the Pacific Island of Guam and holds degress in journalism and library studies from the University of Oregon and the University of Wisconsin–Milwaukee. She is the author of A Death-Struck Year, Isle of Blood and Stone, and Song of the Abyss.